I have many years experience of doing cookery demonstrations and theatre shows. I can present a bespoke cookery demonstration on any subject from historical, to vegetarian, easy entertaining, butchery, local produce, cooking on a budget for students. I have demonstrated at all the major food shows in England and also Barcelona, Cologne and Paris for Food from Britain and The Meat and Livestock Commission. I am able to promote your product and develop specific recipes to showcase the best of your ingredients. Cookery demonstrations are a valuable way of raising funds for charity events and I can operate anywhere from a school hall to a cathedral. My only requirements are twox 13 amp sockets and two six foot trestle tables. Beyond that I come self contained with cooking equipment and ingredients. For more than 50 people I would recommend a PA system and camera with screen. 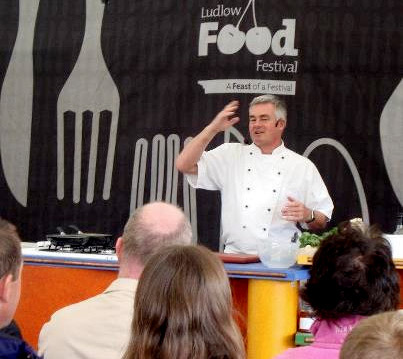 I am co-organiser of Lichfield Food Festival and have also worked with other food festivals on a consultancy basis. I believe it is important to showcase a wide range of suppliers and not to take too many of the same type so they are not in competition with each other. I am particularly keen on British and artisan products as I feel we have so much to offer in this country.